Dynamic Drawing » Archive » Light and Dark! After you have the structure, you need a skin. A lot of that is about lighting, and textures! In this post we’re going to focus on the Lighting! Lighting forms and shapes. Lighting is fairly simple really but it’s common for people to take a while getting into the habit of thinking it fully through as an artist while drawing. The way we describe lighting can be broken down to three properties. Highlights: The brightest areas where the subject is reflecting the light source most efficiently. The number of highlights on a subject is limited only by the number of reflective surfaces on the subject, the number of light sources, and the ability of the surfaces to reflect light. The shape of the highlight depends on the surface of the subject. Midtones: A tone is midway in between the highlight and the shadow. typically the “true” color and consistency of the object. The highlights are brighter than the “true” color, and the shadows are darker than the “true” color. There’s also the Cast Shadow. This is the shadow that the object is making by blocking the light. This shadow may be sharply defined or soft, depending on brightness and proximity of the light casting the shadow. Geometric Constructive forms, with lighting indicators and hatching for tone. Hatching on 2d forms to create the illusion of depth. Lighting organic shapes to define form. I’ll be adding more content and lesson plan material here soon, for now check out this playlist of clips developing tonal drawing with a lot of depth. More Stan Prokopenko! He’s pretty good as i said before. And this is the cool Opale “Sparkles and Wine – Teaser” clip. 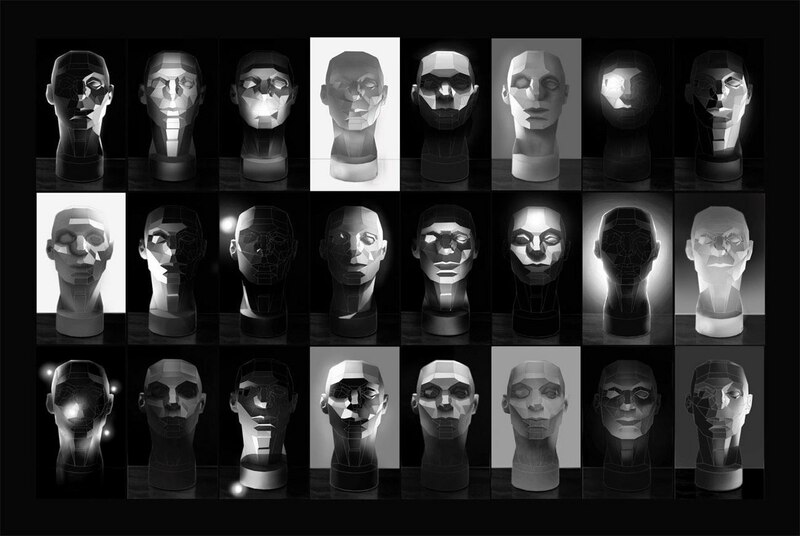 It powerfully illustrates how lighting can dynamically change the look of a face! Helping break down some of what you saw in the clip abouve, here’s a set of Asaro heads illustrating how the planes of the face catch light. Compare them to the woman’s face in the clip and see if you can figure out how it works? Practice copying here, or other models with different lighting in pencil. Start with copying as many Asaro heads as you can stand, then work your way to live still life and human subjects, with all their complexity and nuance. More photos of the heads here on google, sketch those too! If you can get your hands on one, we have a few at the Syn so use those while there. You could probably make one at home too. Here’s an example by a deviantart user of what studies of this kind look like. 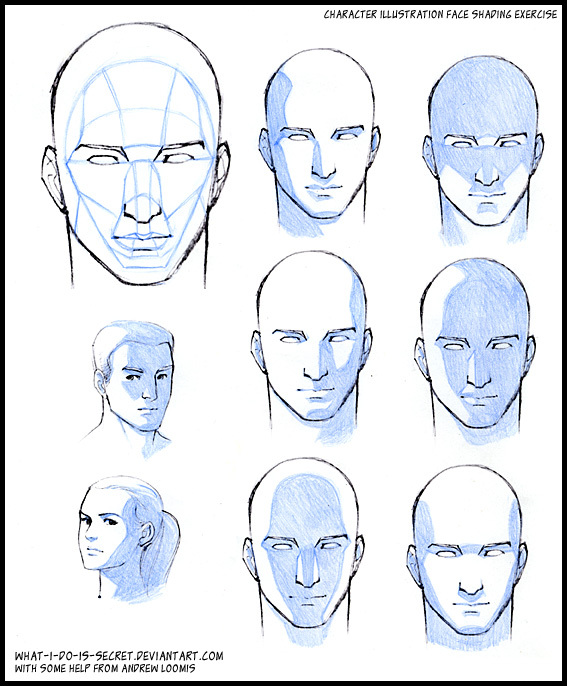 You’ll find more like it as well, in Andrew Loomis’s book, Drawing the Head and Hands. 06/12/2016 | Filed under Class Blogg, Class Resources and tagged with drawing, Lighting, practice, study, The art of seeing, tutorials.